MG Motor UK Limited (MG Motor) is an automotive company with its headquarters in Longbridge, Birmingham, United Kingdom, and a subsidiary of SAIC Motor UK, which in turn is owned by the Shanghai-based SAIC Motor. It designs, develops and markets cars sold under the MG marque. Currently all MG vehicles are produced in China, and MG Motor is the largest importer of Chinese made cars into the United Kingdom. The marque returned to competitive motorsport in 2012, and won the 2014 British Touring Car Manufacturers Championship. The first all-new model from MG for 16 years, the MG6, was officially launched on 26 June 2011 during a visit to MG Motor's Longbridge plant by Chinese premier Wen Jiabao. This car was imported briefly into the UK, but it was not a sales success and was withdrawn from sale in 2016. On 23 September 2016 MG announced that all car production had ceased at Longbridge and henceforth MG vehicles would be imported into the UK. MG Motor UK HQ - SAIC UK Technical & Design Centre. MG Motor operates the historic Longbridge plant. Up until 2014, it is believed that the majority of MG vehicles sold in Europe were manufactured in China, before being shipped to Longbridge where a small number of vehicles were subject to very limited final assembly. As of September 2016, it was announced that this final assembly work would cease and all cars would be imported from China in a finished state, with the loss of 25 jobs. There is also a research and development facility at the Longbridge site which employs around 500 people. In July 2015 MG opened a £30 million flagship dealership in the heart of London’s Piccadilly. Its location is 47-48 Piccadilly, opposite Fortnum & Mason. MG vehicles are designed and developed in the United Kingdom and China and manufactured in China. The MG GS is MG's first production SUV launched in 2015, with sales in the UK commencing in June 2016. The MG GS starts at £14,995, with a 1.5 litre turbo petrol engine delivering 166 PS and 250NM Torque. The top of the range model also comes with the option of a 7 speed automatic transmission. The MG 5 was originally unveiled at the 2011 Shanghai Auto Show as a concept model. It is a Ford Focus sized hatchback using the same base as the Roewe 350, and evokes the light two box design and elegant style of the original MG (Austin) Maestro model produced by the predecessor company. It was released for sale in China in 2012 but has never been exported to the UK. The MG3 was voted the 10th 'Best Car To Own' in the Auto Express Driver Power survey 2015. Unveiled at the Guangzhou Auto Show in November 2016, the new MG ZS compact SUV is due for launch in the Chinese car market in the first half of 2017. It will be positioned below the MG GS. Sales in the U.K is scheduled to start in late 2017. There will be two engines available: a 1.5 with 120hp and 150Nm with a six-speed automatic or a six-speed manual transmission, also a brand new 1.0 3-cylinder turbo with 125hp and 170nm, with a 6-speed DCT or a 6-speed manual transmission. MG unveiled the MG Icon concept car at the Beijing Auto Show in 2012. It is the first SUV concept car from the company and was created by the MG global design team headed by British director Anthony Williams-Kenny. The MG Icon takes inspiration from some of the legendary brand’s most famous sports cars including the MGA and MGB GT. The concept car is designed to slot into the compact SUV sector, one of the fastest growing areas of the global automotive market where style and sports utility dominate fashion trends. The MG EV concept car was unveiled in 2014 based on the Roewe E50 to celebrate the marque’s 90th anniversary. The EV has a claimed acceleration 0-50 kph - 5.3 seconds and 0–100 km/h - 14.6 seconds with a top speed - 130 km/h. The LFP battery generates 52 kW and working in conjunction with the regenerative braking system enables a range of over 100 km. The battery retains more than 80% capacity after 2,000 charging cycles, equivalent to approximately ten years of typical use. The battery takes six hours to fully charge on a standard charge (220–240V), while a fast charge (380–400V) takes just 30 minutes. The MG3 Trophy Championship concept, based on the MG3 production vehicle platform and created to highlight in-house engineering, design and calibration capabilities by SMTC UK at Longbridge, continues the MG tradition of club racing. The MG TF brand was relaunched in Britain during 2007. An updated MG TF model produced in a limited edition of 500, called the TF LE500, was assembled at the Longbridge plant by NAC MG UK. This was followed by a TF 135 model and a further limited edition TF 85th Anniversary, of which only 50 were produced. Production of the TF at Longbridge was suspended again in October 2009 and finally ended in March 2011. MG have said that they will first concentrate on building passenger cars, and have not given a release date for the TF's successor. The MG3 SW, a car similar to the Rover Streetwise, was manufactured and sold in China between 2008 and 2011. The MG6 hatchback was announced in April 2009. It is based on the Roewe 550. The MG6 went on sale in Europe in May 2011. The MG6 GT received generally poor reviews, and the initial single engine choice (1.8 litre petrol) received some criticism. A 1.9 litre diesel engine was added in December 2012. It also had mixed reviews from some in the media as regards the quality of the lower dash plastics though some reviewers said the drive and handling made up for it. A saloon version of the MG6, the MG6 Magnette, went on sale briefly in July 2011 after making its debut in June 2011. The MG6 won the What Car? 2012 Security Award. In the Auto Express Driver Power survey in 2014 it won the 'Best Handling Award'., and came 6th overall in the ‘Best Car to Own’ category . In 2016 the MG6 won 3 awards: Auto Express Driver Power Best Family Car Bronze Winner, Auto Express Driver Power Road Handling Silver Winner. and The Caravan Club Tow Car of the year class winner under £17500. MG / Triple Eight British Touring Cars 2012 - 2014. In January 2012, MG Motor announced that it would enter the 2012 British Touring Car Championship through the newly established MG KX Momentum Racing team. In its debut season the team ran two MG6s driven by Jason Plato and Andy Neate. Plato ended the season in third place, with the car yet to find its feet in wet conditions. In 2014, MG won the Manufacturer's Championship to break Honda's four-year reign. After just three years of competition, the MG6 GT sealed the title by 95 points at the season finale at Brands Hatch. Drivers Plato and Tordoff racked up seven wins and 20 podiums in the 30-race calendar. Plato finished the Driver's Championship in second place, behind Colin Turkington, while Tordoff finished seventh. The 2014 season also saw a third MG6 GT on the grid, driven by Marc Hynes and also maintained by Triple Eight but in a new livery which did not resemble the other two MG cars. Hynes finished his debut season in 18th. For the 2015 campaign MG fought to regain the Manufacturers / Constructors title with a new driver lineup. 2013 Champion Andrew Jordan and young gun Jack Goff paired up in the MG6 to fight against Honda, BMW and Infiniti for the title. MG finished 2nd in the Manufacturers / Constructors title challenge, with Andrew and Jack in 5th and 9th position respectively in the drivers standings. MG announced a new three-year contract extension with Triple Eight Racing for the 2016 BTCC campaign. The team plan was to bring in young and up-and-coming drivers with an intention to grow its own champion over the duration of the contract. Josh Cook, a former 2014 Renault UK Clio Cup Vice-Champion, and BTCC 2015 Jack Sears Trophy winner (award for the top rookie) and Ashley Sutton, graduating to BTCC after leaving the Renault Clio Cup as reigning 2015 champion, were announced as the new line up for MG. After a hard fought campaign the MG drivers finished in 12th and 13th place respectively, with Ash picking up the Jack Sears Trophy for the top rookie. 1 2 3 4 "China 'can get MG back up to speed'". Birmingham Mail. 20 October 2013. Retrieved 20 October 2013. ↑ "MG Motor UK Ltd". UK Companies House. Retrieved 28 September 2016. ↑ "New lease of life for Longbridge". BBC. 22 February 2006. Retrieved 26 July 2009. 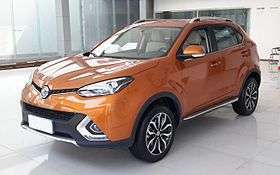 1 2 "Nanjing Auto Rolls Out First `Made-in-China' MG Cars". Bloomberg. 27 March 2007. Retrieved 3 May 2012. ↑ "Production resumes at Longbridge". BBC. 1 August 2008. Retrieved 25 July 2009. ↑ "SAIC merges with Nanjing". CAR Magazine. Bauer Media. 28 December 2007. Retrieved 26 July 2009. ↑ "Longbridge workers laid off". Birmingham Post. 21 January 2009. Retrieved 26 July 2009. ↑ "China's £1bn business deal with UK". The Telegraph. 26 June 2011. Retrieved 4 March 2012. ↑ "China's premier promotes Sino-UK trade synergies". Reuters. 26 June 2011. Retrieved 4 March 2012. ↑ "Chinese owners plan more investment into MG Motor UK at Longbridge". The Birmingham Post. 24 May 2012. Retrieved 1 August 2012. ↑ "2012 new car market tops two million units, a four-year high". SMMT. 7 January 2013. Retrieved 21 January 2013. ↑ "MG3 review". The Telegraph. 4 September 2013. Retrieved 20 October 2013. ↑ "MG 3 UK first drive review". Autocar. 4 September 2013. Retrieved 20 October 2013. ↑ "Best car manufacturers 2014". Auto Express. 30 April 2014. Retrieved 9 February 2015. ↑ "MG records 361 per cent growth in UK registrations during 2014". AR Online. 7 January 2015. Retrieved 9 February 2015. ↑ "MG to end UK car production at Longbridge with switch to China". BBC. 23 September 2016. Retrieved 15 October 2016. ↑ "New £5m MG design studio unveiled at Longbridge site". BBC News. 15 June 2010. Retrieved 29 July 2011. 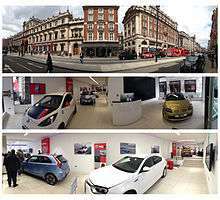 ↑ "MG opens four more dealerships including flagship central London outlet". Birmingham Post. 2 April 2015. Retrieved 30 April 2015. ↑ "MG unveils new super-mini at Longbridge". Express & Star. 12 June 2013. Retrieved 11 October 2013. ↑ "Shanghai motor show: MG5 Concept". The Telegraph. 19 April 2011. Retrieved 29 July 2011. 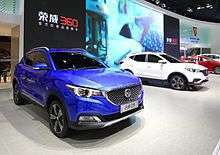 ↑ "MG's Focus rival unveiled in Shanghai". Auto Express. April 2011. Retrieved 29 July 2011. ↑ Bird, Guy (29 August 2008). "MG TF LE500 (2008) CAR review". CAR magazine. Retrieved 2 December 2009. ↑ "Press Report : MG making 85th Anniversary model at Longbridge". www.aronline.co.uk. AROnline. 14 August 2009. Retrieved 2 December 2009. ↑ "BBC News: No car production 'until spring'". news.bbc.co.uk. BBC. 17 October 2009. Retrieved 2 December 2009. ↑ "MG 'wants a new sports car'". Autocar. 23 March 2011. Retrieved 26 March 2011. ↑ Holloway, Hilton (20 April 2009). "MG6 to go on sale in the UK". Autocar. Retrieved 2 December 2009. ↑ "China-Developed MG6 Will Be Built in U.K.". Edmund's Inside Line. 23 November 2009. Retrieved 2 December 2009. 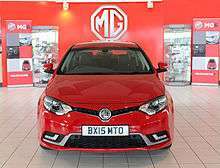 ↑ "Magnette's back as MG 6 saloon". Auto Express. 10 June 2011. Retrieved 3 May 2012. ↑ "MG6 Magnette TSE review". Autocar. 7 June 2011. Retrieved 3 May 2012. ↑ "MG6 1st Best Road Handling". Auto Express. 23 April 2014. Retrieved 23 April 2014. ↑ "MG6 6th Overall Best Car to Own". Auto Express. 23 April 2014. Retrieved 23 April 2014. ↑ "MG6 2nd Best Road Handling". Auto Express. 20 April 2016. Retrieved 20 April 2016. ↑ "The Caravan Club Tow Car of the year class winner under £17500". Caravantimes. 24 September 2015. Retrieved 24 September 2015. 1 2 3 4 5 6 7 8 "MG". Left Lane. Retrieved 15 October 2016. ↑ "MG makes a return to racing". The Telegraph. 25 January 2012. Retrieved 25 January 2012. ↑ "MG WINS FIRST BRITISH TOURING CAR CHAMPIONSHIP MANUFACTURER TITLE". MG Motor UK. 14 October 2014. Retrieved 14 October 2014.